The fascination with stories has been a hallmark of mankind across culture. We love stories because they help us connect with ourselves and others on an emotional level; stories with an emotional trigger make us more trusting, understanding of others and open to ideas. According to cognitive neuroscientist Michael Gazzaniga, we love fiction because the stories give us a template of what to do if we ever find ourselves in a situation, similar to the one described in the story. And that is just referring to linear stories… We now have the opportunity, thanks to video games, to experience non-linear stories, and take the audience one step further. “Linear storytelling tells a story to the audience. Interactive storytelling delivers a sense of story for the audience.” – Matthew Luhn. “You need to have a hook. You need to grab peoples’ attention from the very beginning. Whatever it is, at the very beginning of something you make, you’ve gotta hook the audience… It works for games and movie.” – Matthew Luhn. If your story has a clear hook, an emotional charge, a tragic element and a heroic character struggling with everything…then your players will be asking themselves: What is going to happen next? And they will not stop playing your game until they know the destiny of the characters. “Great stories are all about characters changing… If you create a story and nobody changes, it feels a bit shallow. You can get the audience to experience the character’s journey through good storytelling.” – Matthew Luhn. Characters are an essential part of any story. And by characters I mean anything, not only people: Animals, places, inanimate objects… They can all become characters and protagonists of their own stories. Characters are the main reason stories exist, without them we would have no stories. However, as a story is told, those characters change and evolve, many times, in a complex way that makes the story more moving. “I always want to know who is my audience… Create an interesting world/environment that people can connect to and understand.” – Matthew Luhn. People are willing to believe in anything, no matter what, give them something engaging to start with and you have taken the first step in connecting with your audience. 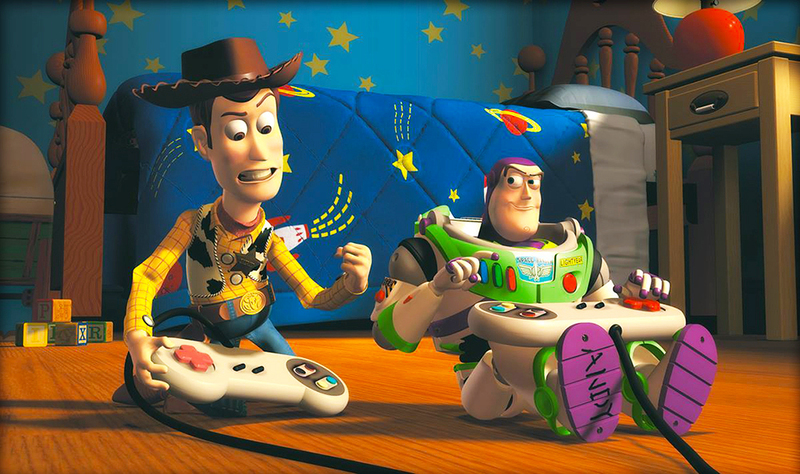 Having your players, identify themselves with the characters in the story, is essential to a successful story. If you achieve that, if your players are so immersed in the game and immersed in the story so much that they take on the characters’ emotions as their own, when they feel and live the story, rather than just witness it, you know they are connected to the characters and experience their story. “If you want to make your story authentic, make sure it’s something the director is really passionate about. Don’t be clever, just be vulnerable and be honest.” – Matthew Luhn. Make people feel something, instead of making the common mistake of trying to suggest to your players, what they should feel. You want to give your players the freedom to feel all that they can feel, which is absolutely beautiful. Each person will feel emotions and experience reactions perhaps even you as the creator of the story, haven’t thought of. Allow your players to surprise themselves and if you were there next to each one of them, allow them to surprise you. Another important factor to creating a good story is structure. Make a story with a beginning, middle and an end. You need structure if you want to create an engaging game. He also described it as set up, build, pay off. “We like this,” he said. “This is built into who we are. It’s in our DNA.” – Matthew Luhn. 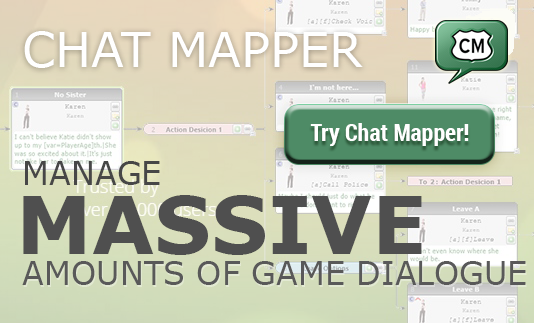 Create your own realistic non-linear dialogue between characters for video games with ChatMapper!